Episode Writer Samantha Humphrey dishes on stunts, scouting, and a personal interest behind "Fences." Would you help solve a crime if doing so could get you and your family in trouble? In S.W.A.T. 's "Fences," a young illegal immigrant steps up to help the team—putting his and his sister's future in jeopardy. Sadly, this happens all too often in policing. Samantha Humphrey, Writer of" Fences" and a Co-Executive Producer of the show, shared insights with CBS.com about how current events impacted the episode's storyline, as well as how the show's high-octane scenes are filmed, and what happens when a "fan" gets a bit overzealous. In order to get the perfect pursuit shot, the crew filmed the episode's first chase scene in four takes. "In order to conserve the actors' energy, Director Alex Graves blocked and rehearsed the scene with stunt doubles first," explained Humphrey. "Once the crew had the moves down, the actors were brought in." 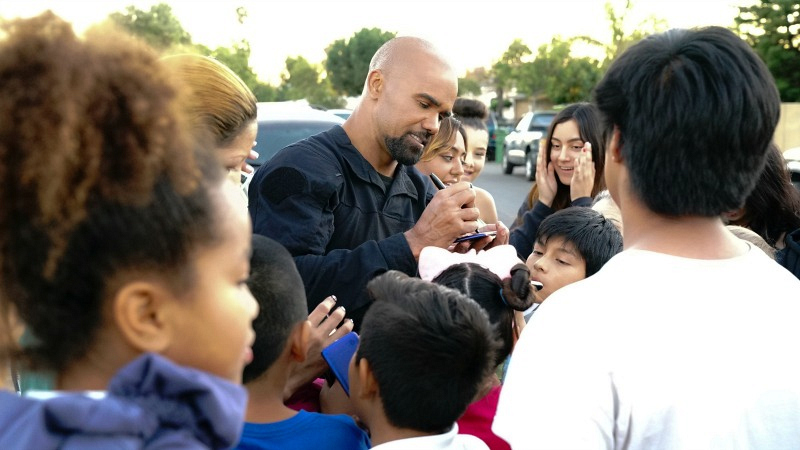 That said, both Shemar Moore, who stars as Hondo, and Alex Russell, who stars as Jim Street, opted to forego using their sub-ins and do the entirety of the run themselves—conserving some energy for later takes thanks to the crew's efficient prep! Law enforcement is on the same team—except when they're not. In "Fences," S.W.A.T. tackled the concept of "sanctuary cities," a term which has been applied to LAPD's real policy to not engage in enforcement activities solely based on immigration status. The local concern is that police will have trouble getting the community to cooperate with investigations and reporting crime. In LAPD's case, they will not work in conjunction with Homeland Security on deportation efforts—creating an inherent conflict between two law enforcement organizations. For Humphrey, whose young son is in elementary school, the episode's plot also had a personal significance. "When I found out that there are 9,000 public school educators protected under DACA in this country those educators are at risk of being deported, that hit home," she said. "The idea that a child's school teacher is at risk for being deported because of a political reversal sheds light on how complicated this issue is and how it impacts every economic and cultural strata in this country. No one is immune to this nuanced issue and everyone should care about it." "Sanctuary cities" may not be as secure as they seem. Recent raids conducted by federal ICE agents have instilled the fear of deportation should an illegal immigrant report a crime or help the police. That's why safe houses, like seen in the episode, really exist from Los Angeles to Buffalo, New York. Some can be in homes rather than churches. SWAT can't just drop in. There's a lot of planning behind the descent scenes. 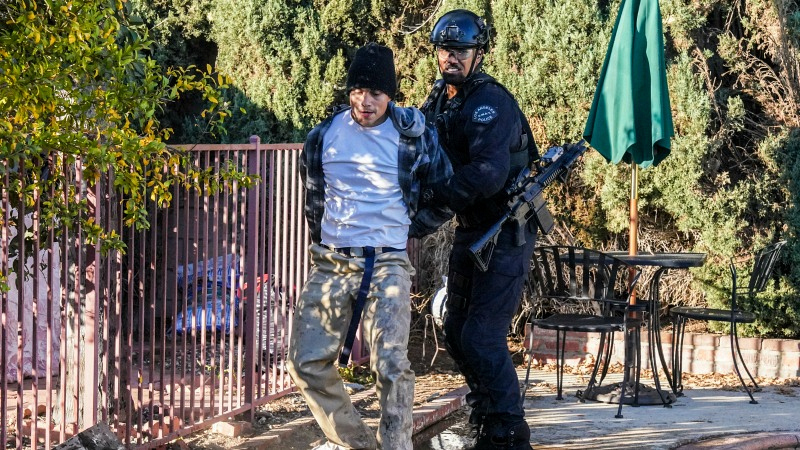 In order to film the action-packet sequence in "Fences" when SWAT moved in on the home where Ochoa was hiding, production first had to find the ideal location. Before the cameras rolled, there were several scouting trips (Director, Location, and Technical) to check out the setting—each visit adding more specifics to the plan. Of course, the stunts team also had to meet and rehearse prior to filming. And on the day-of? Director Alex Graves made even more adjustments! In the episode's protest scene, we saw how SWAT handles crowd control. Many aspects of the show are true to LAPD's protocol—and this scene was no different. "The key protocol element was to not create any sort of panic," Humphrey shared, "That is why the team is not in tac gear, but rather in patrol uniforms and we don't see them use guns. It's also why they do their best to capture the criminals outside the crowd rather than confront them in the middle of it all." 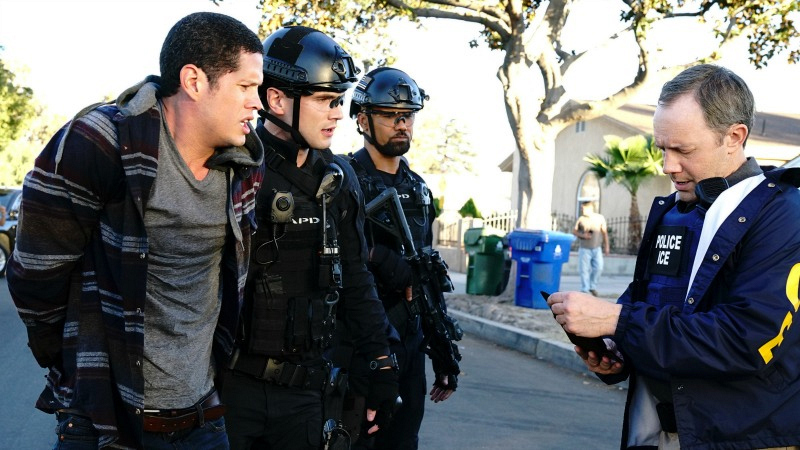 When filming large scenes in public places like this episode's protest, S.W.A.T. 's First AD and crew keep the fans at bay. However, one "civilian"—a goose—caused quite a stir during the park protest scene. The winged nuisance, who developed a fondness for Lina Esco, kept following the S.W.A.T. star into frame. "A director, actors and 250+ extras waiting for a goose to get out of the shot..." mused Humphrey.